Inder Loves Folk Art: KCW, Day 6. The weather here has taken a decided turn for the nippy, especially in the mornings. We are still resisting turning on the heat (because it's really expensive), but I don't think that can last much longer. I guess it had to happen eventually. Deep sigh. 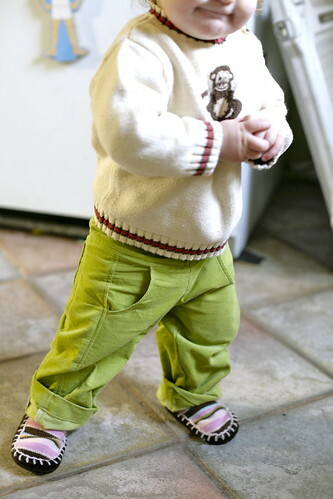 I finished this pair of cozy baby wale corduroy pants for Miss Maggie a couple days ago, but didn't get a chance to try them on Maggie and take some photos until this morning. 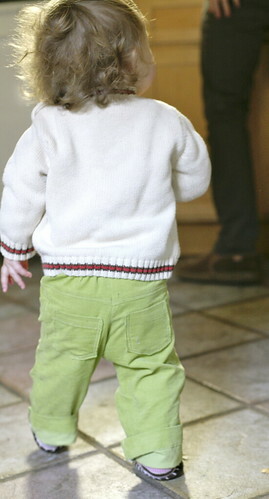 This are the After School Pants from oliver + s and this was my first time sewing them up. Seriously? What took me so long? I love this pattern! I love the yoke and pockets way more than I thought I would, honestly. This is one of those patterns I held out on for a while, mostly because I didn't love the use of contrasting fabrics so much. It was really Brittney's amazing boy versions that sold me on this pattern. I love how this pattern looks in a solid color. The details really shine. I have already cut another pair for Maggie (I am thinking of lining it with flannel for really chilly days) and I want to make them up for Joe too. The best part was that I used the very. last. scraps of this light green corduroy. Remember, I'm trying to make this "stash-busting KCW" and use (1) old fabric and (2) as-yet-untried patterns. These pants fit the bill perfectly. I have had this corduroy forever. I used it here, here, and here. It's lovely stuff, but I can't say I was sorry to see the last of it! There's only so many times you can utilize a fabric! These are a bit big. Even though Maggie still fits size 6-12 month in oliver + s patterns, Maggie has heaps of clothing in that size, and I just couldn't bear to make another tiny garment for her. 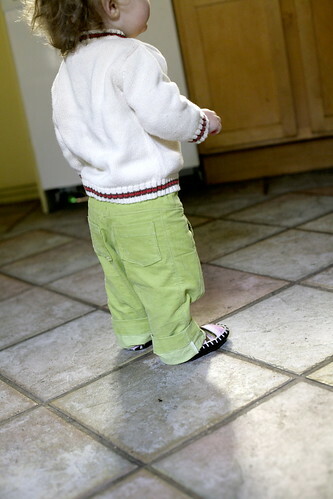 So I sewed them up in the 12-18 month size, and they are roomy but totally wearable, and should last a while. And now, I am sewing Halloween costumes in earnest! How is your KCW going? 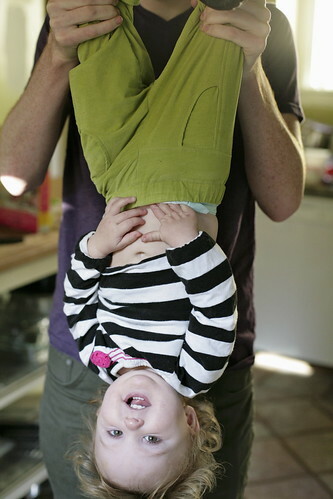 The pants are adorable as is miss Maggie!